This consists of books II and III of the trilogy The Inward Journey. The first book, Initiation in the Aeon of the Child, came out in 2009. The Angel & the Abyss immediately grabbed and held my attention from the very first sentence: "One of the primary goals of the Neophyte of the A.'. A.'. consists in a resurrection from a Death which the world calls Life." I remember first hearing this idea from E.J. Gold shortly after moving to California. The subject and importance of Death in post-Crowley Thelemic literature seems to have been largely overlooked. Gunther remedies this and then some in the book's first chapter, The Self-Slain. I thought I knew most of the references to Death in AC's writings and it's relevance on the path of Initiation, but I was wrong. The first chapter reveals much more than I knew existed and backs it up with a coherent, well-referenced narrative that inspires and feeds work along these lines, the lines of using Death as an extremely effective method of initiation. Gunther appears an extremely knowledgeable scholar in a multiplicity of traditions in the areas of religion, mythology, psychology and philosophy as well as being a foremost Thelemic authority. He's adept at pulling out obscure references making cogent points that explicate Thelemic theory and practice. This gives a lot of backbone and strongly establishes the high probability that Thelema presents a new formulation of an ancient tradition. Gunther's scholarly discourse always engaged me, it never got dry or boring due to the sense conveyed that he lived it, he speaks with the authority of experience. Not that I always agree, but his thinking always appears original, stimulating and creative. If anything can make Crowley and Thelema academically respectable it would likely be this trilogy. Many of the quotes from ancient writings are reproduced in their original languages in the footnotes which include Coptic, Greek, Latin, Egyptian Hieroglyphs, and Sanskrit. Some might find this pedantic, but I suspect future researchers will delight with the depth and broad scope this brings. The content of The Angel & the Abyss resembles what the radical post-structuralist philosophers Deleuze and Guttari call a rhizome. A rhizome is a metaphor borrowed from botany where it describes an underground mass of roots that mostly grow roots laterally though they can still grow shoots upwards. In D & G's model, rhizomes represent an aggregate of multiplicities that communicate laterally to other multiplicities. In other words, there appears no set program or specific goal apart from the broad framework labelled the Knowledge and Conversation of the Holy Guardian Angel. Since this will manifest uniquely different for everyone there endeavors to be a realization of multiplicities both in the sense of many individuals and of the multiplicities of experience in any one individual. The KCHGA seems more of a dynamic endless becoming than a static being which agrees with the rhizome view. As mentioned, this book transmits a multiplicity of information: historical footnotes, obscure religious rituals, archetypes, Egyptology, tarot, interesting cross-references in Thelemic writings to name a few. All of the diagrams included look great communicating useful nonverbal data. Gunther not only supplies a strong foundational background and context for Thelema, he not only brings to light much that seemed obscure in Crowley's writings, but he also expands upon Thelema proving that it exists as a living dynamic school open to new creative insight. "Constances "dream board" placed squarely over the washing machine. To me this page looks like a deceptively simple yet powerfully effective opening dedication which underscores the homemade aesthetic of the whole book. Strong magick. Like my father and brother before me, I was born in Southern California and journeyed to rural Nebraska to find a bride. As seems obvious already, Duquette is extremely generous with inviting us readers into his life, his family and home revealing many practical details of functioning as a magician in contemporary society. The book is engaging, easy to read yet has a lot of depth. It could have easily been subtitled Autobiography of a DIY Magus. I particularly liked the section on Magical Weapons. It sparked some new insights. I recommend Homemade Magick unreservedly. There appears a lot more to it that will eventually meet the eye. These have both been out since 2004, but are now out of print and often expensive on the used market. I was fortunate to find these recently at a decent price. Frater Progradior is Frank Bennett, an Englishman who relocated to Australia spearheading magick and esoteric practice into that continent first with Theosophy then with Thelema. He spent time with Crowley at the Abbey in Cefalu. His record of that time reveals what it was like to live and work there, a valuable addition to other accounts by different residents and visitors. Bennett is the person whom Crowley was discussing the HGA with relative to the subconscious mind when something Crowley said triggered a profound epiphany in him that lasted a few days at its peak intensity. Crowley then suggested that he go on a magical retirement to consolidate the experience. It encouraged Crowley to work diligently and furiously at completing Liber Samekh which was his adaptation and expansion of the Bornless Ritual for the purpose of attaining the Knowledge and Conversation of the Holy Guardian Angel. Crowley did finish it in time for Progradior's retirement and dedicated it to him. Frater Progradior could safely be called one of Crowley's senior students. Richmond does an excellent job creating a vivid portrait of him without a whole lot to go by. Much of his personal archives were destroyed by a crazed son who objected to and completely misunderstood his lifestyle. I find these kinds of accounts helpful for getting a sense of the atmosphere of the Hermetic mileau back in that day; useful history. Richmond includes a copy of Liber Samekh in The Magical Record. That kindled my interest in that ritual which I'd never really explored before. I found a good synergy with reading Liber Samekh while listening to John Coltrane's A Love Supreme. His Cosmic Music also works well. They seem like twin recordings. The bass line for A Love Supreme sounds very similar to the bass pattern in Lord, Help Me To Be from Cosmic Music. This is by no means a review. Mason & Dixon is included here because it appears a powerful magickal text worthy of serious study and application. Yes, the book certainly seems multi-level, a rhizome of multiplicities, and I'm only focusing on one, rather extensive, strata of the assemblage, but this strata, the layer of magick, seems rarely touched upon by Pynchon exegesists though it appears blatantly obvious to me; also blatantly obvious that TP writes with as much hierophantic authority as the other authors mentioned here. If you like first rate literature, superb dry humor, whimsy, history, political opinions, puzzle solving and much else thrown in with subtle and wise magick instruction then you might, as I do, find Mason & Dixon in your library alongside other classics on the subject. Mason makes quick Head-Turns, to the Left and Right, and lowers his Voice. Whilst you've been out rollicking with your Malays and Pygmies, ... what have you heard of the various sorts of Magick, that they are said to possess?" This paragraph reflects the range of esoteric communication and reference from the explicit question at the end to the qabalaisticly significant correspondences at the beginning. This same range even turns up on the front cover with an explicit image in the center and two word fragments above and below that carry qabalistic relevance related to the central sign. If the image portrayed by the stylized ampersand still mystifies you can always turn to the top of p.261 for a straightforward explanation of the cover. The writing style of novel ostensibly reflects the style of the period it writes about. In that time, mid 18th Century, it seemed common for all nouns to get capitalized. Pynchon doesn't do this to them all, but it does afford him license to capitalize much more than normal thus allowing much freedom to place emphasis on different things. Some reviewers find this an annoying kind of affectation while the alert qabalist correctly recognizes this as another method of communication. He also apparently uses common spelling and vernacular of the period allowing him to get away with things like adding a "k" to magic. Notariqon is a branch of Qabala that derives messages from acronyms. Pynchon seems to make capitalization choices along these lines frequently. For instance, in the paragraph mentioned above from p.261 that explicitly describes the front cover, one sentence begins: " Even Quakers are out in the Street, ..." When you add the caps, E+Q+S you get 165 which has one meaning in Crowley's dictionary ( 777 and other Qabalistic Writings) of "to make them know," exactly what this paragraph accomplishes with the front cover. Three years ago I wrote a blog on Gematria that concluded with a look at the significance of the number 68 in Shea and Wilson's Illuminatus! trilogy. I also mentioned that Robert Anton Wilson used the SC notariqon prominently in his fiction oeuvre - Schrodinger's Cat, Sigismundo Celine, Celine's System. SC = 68. Both Eric Wagner and RAW had the impression that Pynchon read at least some of Wilson's Historical Illuminatus books before writing Mason & Dixon. I don't doubt this as I've seen clear references to Wilson in other Pynchon books. The Historical Illuminatus trilogy also transmits qabala and the strata of magick both explicitly and obliquely. I mention this now because Mason & Dixon shows the SC combination to what can only get called an excessive degree. 68 also relates to the realization Crowley made in The Paris Working about the identity of Christ and Mercury. In the Book of Lies chapter 68 he associates this with Manna, divine food. Within the first sentence of M & D Pynchon takes us into "the great Kitchen" and describes the tantalizing food cooking there. In certain Sufi schools the kitchen is considered the heart of the community. Not that there don't exist other interpretations for the prevalence of the SC combo. Like any qabalistic motif, it appears a rhizome i.e. multiplicities sending out roots of significance to other multiplicities. It might be beneficial to study the tarot cards associated with S & C, Art and the Chariot in the Thoth deck, and note how they synergestically relate and create. On p. 479 a clear description of Gematria is given, a glance at the inner workings of the magick strata in this novel. The overarching story of two surveyors/astronomers, Mason and Dixon, exploring and scientifically mapping out unknown territory metaphorically resonates with the practice of Magick. The archetype of twins turns up prominently. Mason and Dixon are twins in their vocation. The context of the novel is that their story is being told by Reverend Cherrycoke to a family gathering. Two of the children are twins named Pitt and Pliny so that either one could be the Elder or the Younger, in imitation of historical figures, and because no one knows who was born first. "Twins" is the last word on the first page. In the Thelemic pantheon, Horus, the guiding force of this aga, is said to be a twin god comprised of an active aspect, Ra Hoor Kuit, and a passive or silent aspect, Hoor Pa Kraat. By their names, Mason and Dixon suggest a male/female, yin/yang type of binary unit. Ma-son = yin, Dix-son = yang through common slang. Charles Mason does appear the more introverted and reserved of the two while Jeremiah Dixon seems far more outgoing. He likes to party and chase women. The famous line they charted, the Mason/Dixon line was commissioned to draw a border between the then Provinces of Pennsylvania and Maryland. The names of those territories also suggest a male/female binary unit by the same logic, in this case one that gets separated and divided. This seems a very apt metaphor for the internal process of an Aspirant making their way through the desert of the Abyss. "... excepting a sinister and wonderful Card Table which exhibits the cheaper sinusoidal Grain known in the Trade as Wand'ring Heart, causing an illusion of Depth into which for years children have gazed as into the illustrated Page of Books..."
Wand'ring - wand = yang, ring = yin. I am just scratching the surface, but I think you get the drift. 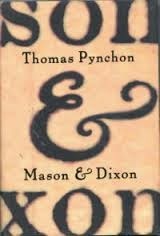 A thick volume of commentary could easily be written on the strata of Alchemy and Magick that exists in the Pynchon novels Mason & Dixon, Against the Day, and Bleeding Edge which all connect with each other on that level. "We can get jobs said William, "save enough to go out where you were," said Doc. "The Stars are so close you won't need a Telescope." "The Fish jump into your Arms. The Indians know Magick." "We'll go there. We'll live there." "We'll fish there. And you too." I've mentioned these before, now it's time for an update. Prosperity Path orbs are computer video game-like environments created by E.J. Gold and his team of designers. They were made and play back on the G.O.D.D. (Gamemaker Of Diabolical Distinction) engine. For me, these runs through alternate cyberspace worlds represent the leading edge of bardo/magick/consciousness technology. There are currently over a hundred orbs with a variety of intentions anywhere from simply feeling better to promoting world peace or helping someone transition into the afterlife; learn how to fly or astral project. They don't take a lot of time either. It's unusual to do a run for more than 10 minutes though a few of them can go awhile. Several orbs take 2 - 3 minutes or less. What follows are rough notes I've made from recent research. I've been working with these daily for about 2 and 1/2 years. It helps to adopt the viewpoint that these worlds have their own reality as valid and meaningful as anything else. You, the player, are out of body, but your avatar is your body in that world so try to experience the cyberworld as your avatar does and realize that what happens to your avatar happens to you. Enter that virtual reality. A page called How to Run a Prosperity Path Level expands on this. These orbs can be studied like Tarot cards. Some people have written detailed books on the symbolism in the Tarot even going so far as to examine details of the card with a magnifying glass. The P.P. orbs can yield much information when observed with the same attention to detail. Sometimes the orbs read like a 3D Tarot card. The first important action at the beginning is to name the player who will run the orb. It can be yourself or someone else. It's common to run levels for other people. It sends them good wishes at the subatomic quantum level. I was setting up to mix a project when the tragic news arrived of a death in the band. I had my laptop with me and immediately ran the Clear Light orb for him. Observing the graphics, the assistant engineer remarked, " Cool, a spiritual video game." As thinking nothing of herself, a mother's love unfolds and cherishes her only son, so now through the world let they compassion move, and cover everyone. Even robbers will permeate with stream of loving thought unfailing; and forth from them proceeding, enfold and permeate the whole wide world with constant thoughts of loving-kindness, ample, expanding, full of divine approval, joyously free from enmity, free from all suspicious fear. Yea, verily, thus my disciples, thus must you school yourselves. Kerouac's ecstatic description of Buddhism in general (not only the quote above) resembles Crowley's theurgic magick in some ways. The Buddha is in the park in the Peace orb. Actually there are 11 Buddhas in 4 different park areas. You start out facing a large, broad and deep park environment, very green and woody, lots of trees and foliage, that has 6 Buddhas, 3 on each side, just before the entrance to the light wash corridor on the other side. On the right is the entrance to a park with two fountains spraying water in front of three Buddhas. To the left is another park housing a single large Buddha with white light water falls on either side. All the spaces have audio clues, you hear the water flowing out of the fountains and waterfalls along with the sound of the outdoors. Behind you is a fourth park area with a large Buddha statue set in the middle of a pond. In the far corners on either side are floating bezels with images worth checking out. Shining emptiness of pure femininity. I began running this level for the Gaza strip last summer after hearing about too many horrific acts of war happening there. They finally figured out a lasting ceasefire about a week to ten days after running Peace every day. It's a coincidence to be sure, but I'll take it. I felt a strong connection with both Israel and Palestine from working and making friends with people who lived there only a few months before the unrest. You can run orbs for places that cover large populations as well as running them for individuals or yourself. "Your matrix attunement was successful, COUPLING FACTOR is in." 'Coupling factor is in' means the connection exists between the player and something beyond the player (the matrix) that allows change to occur according to will. Coupling factor also relates to the esoteric idea that one requires a mediator of some kind to experience absolute reality. In qabalistic terms this mediator exists in the domain of Tiphareth, the central sephira on the Tree of Life. Cubes have 6 sides and the key number for Tiphareth is 6. The cubes in these orbs have 9 circular ports on 4 sides, not the top or bottom, making a total of 36 rotating ports. 36 = 6 x 6 and herein lies another clue. A coupla sixes. Also, Buddha is a character from Tiphareth so all the Buddhas encountered could be seen as coupling factors or mediators. At the bottom of the screen in every game are two rows of attributes that increase or decrease as you go through. Qualities such as: Protect, Healing, Shakti, Clarity, Endurance, Karma, etc. etc. These will vary from level to level. As a whole it's called a Heads Up Display ( HUD) which is "any transparent display that presents data without requiring users to look away from their usual viewpoints" Many of the levels have a point that triggers a full HUD i.e. all attributes automatically set to maximum. Above the entrance to the final wind-up in the Clear Light orb is a sign that says: "Have You Spent Your Life Wisely?" I can't see how this question wouldn't arise in anyone's life at some point especially as one gets older. Wisely adds to 121. 121 = 11 x 11. 11 is the general number of magick, energy tending to change. In many of the orbs, at the end of the run, you see a target image like a Buddha, a Lady in White, or a large Crystal that represents the finish. On either side of this final image, posted like sentries, is a black and a white cat. In other orbs, the remedy orbs for instance, the cats are stationed in front of the woman who tells you that you're out of body and to choose an astral body. The cats also turn up on pedestals in one of the chambers on the run. I associate these cats with the black and white sphinx's that pull the Chariot in the Golden Dawn Tarot. The way I see it, these sphinxes or cats signify the animal component of the body/mind complex that when harnessed and going in the same direction provides the power or motive force to drive the Chariot. Crowley modifies the card to include four sphinx to represent the 4 lower centrums, the physical, emotional, intellectual and the social. It never hurts to read up on the Chariot card in Crowley's Book of Thoth for major info on the Work. He called the Chariot the formula of the aeon of Horus, in other words, a guiding set of instructions for enabling the fruits of this age, Life, Love, Liberty and Light. The path of the Chariot connects Geburah with Binah, Horus with the Mother, the sephira of force and fire with the one of Universal Emptiness. The black and white cats that you have to run past to get to the end or the ones in front of the Astral Body Guide all seem to indicate that it's necessary to go through and past the animal nature to get to the higher levels; no other way to do it. Gold once remarked offhand that the colors found in these levels have a significant effect. One of the coolest orbs, in the sense of cooling down, is called Panic. This level invokes for me the element Water more than any other even though you see lots of water in many orbs. I suspect the particular shade of blue used has something to do with that along with the solo flute music that plays. I also like taking a dip in the huge fountain at one end. Many of the Cleansing and Specialty orbs end with a run down a light wash corridor. I call it a light wash because the first time I saw it was in a level called Karma Wash. The light corridor is set up like a car wash where you proceed through rows of different colored, bright intense lights. It even has a car wash soundscape. It can be interesting to stop at the end of the light corridor, don't go into the very last chamber where the run ends, but hold the space bar and go through the light corridor in reverse. When you move forward through it again it seem that much more intense. There's a very intense light tunnel of a different kind about 1/3rd as long in the Conflict orb. A large sign that says LIFT marks the entrance. Going back and forth through it a few times can be effective. Brute - a gray/blue castle with multicolored lights, lots of white mixed with red, green and yellow in a way that looks superficial. Human - bright, intense and rich yellow. Hell - a gray castle with mostly white light light in the interior, but with smatterings of other colors mixed in. Sun Absolute - deep rich dazzling blue. New ways of showing old models; entering the Color Scheme of each World gives an experiential feel that sinks in deeper than only reading about it. Stress Relief is another favorite orb that I run regularly. It has a Chamber of Thoughts where you get to shoot down all your thoughts which appear as floating crystals of different colors. There's a Chamber of the Stars, a dark expansive space with celestial lights and patterns floating about. Every morning in the dead of the night I walk about a quarter mile through the Sierra Nevada wilderness to go to a floatation tank room. The Chamber of the Stars has a very similar mood. You can download Prosperity Path Orbs HERE. They are $.99 each and run best on a PC. On Dec. 8, 2014 the internet radio show Making Life Brighter broadcast an interview with Yours Truly by host Winifred Adams. The show transmits on the Health and Wellness Channel of the Voice America Talk Radio Network. Healing and Consciousness are the threads that connect the weekly shows. The interview is HERE: It's an hour program. On the right of this page under Episode Directory are the archives of all the previous and subsequent shows. Lots of interesting guests of different kinds worth checking out. Subjects of the interview include the recent Exploring the Hidden Music show and its centerpiece Heartbeat, a short history of my humble roots in sound, influences, memorable moments, setting up the space for a session, the power of music, changes in technology, in the music industry and more. I know Winifred as an excellent singer and songwriter. We were introduced when John Wooler flew me down to LA to record her and the musicians he'd assembled to back her up. We talk a little bit about that session in the interview. I wrote a blog about it almost exactly 4 years ago called Who Will Shall Attain from a Crowley poem that closes it which reminded me of Winifred and also served as my New Year's greeting that year ... or any other year including this one for that matter.